The 141st edition of the month long ‘Vasant Vyakhyanmala’ (Spring Lecture Series),starts April 21 at Tilak Smarak Mandir. This lecture series was originally started by Justice Mahadev Govind Ranade in 1875. I had written an article about this great 141 year tradition few years back, and I am reproducing a version of that below. I have also included the schedule for this year’s lecture series (click on the images at the end of this article). Do try to attend as many lectures as you can! 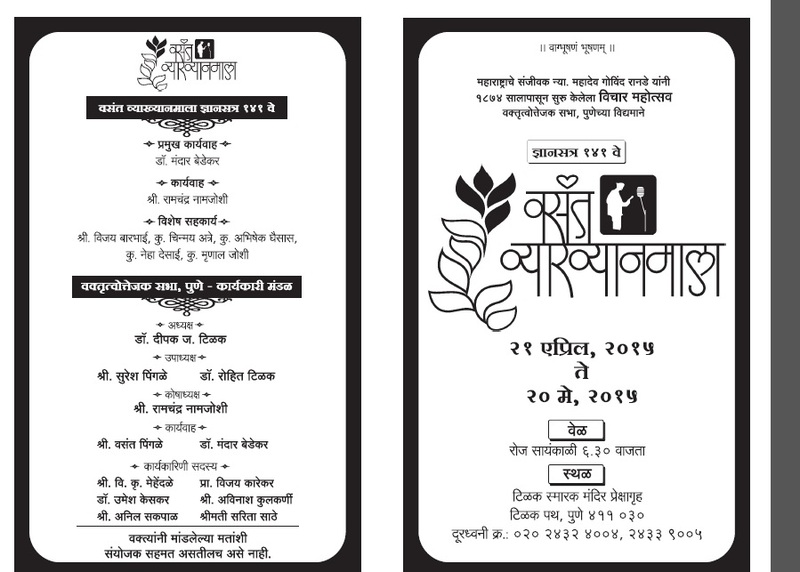 Do note, many of the lectures are in Marathi (a few are in English). Also, do share this schedule via social media. Please use the hash tag: #VasantVyakhyanmala or #वसंतव्याख्यानमाला in your tweets! This year’s schedule covers a series of topics including governance, technology, infrastructure, science, music, literature, healthcare and many more. The inaugural lecture on April 21st will be delivered by Shri Devendra Fadnavis, the honorable chief minister of Maharashtra. Compared to past 2-3 years, this year’s line up looks better. Some of the interesting speakers to look forward, over the month: Ninad Bedekar, Madhav Gadgil, Ravi Pandit, Arun Firodia, Girish Kuber, Parag Karandikar, Anil Avchat, Vinay Sahasrabuddhe, Sadanand More, and more. In recent years, TED and TEDx events are getting quite popular. They do a great job of presenting ideas from various experts and thought leaders. The first TED India event was very well received and many TEDx events have been held in various cities in India over the past year. But did you know that an event similar in concept, but covering a broader range of topics, has been going on in Pune for 136 years! The great tradition of the ‘Vasant Vyakhyanmala’ (translation: ‘Spring Lecture Series’) was started by Justice M.G. Ranade in 1875. The idea was to present a variety of lectures, across various topics to the people. In those days, newspapers were in their infancy (Kesari had not yet started) and live lectures were the most effective medium for knowledge transfer. Since the 18th century Peshwa era, Pune has always been a center of knowledge and education. Post the fall of the Maratha Empire in 1818, Pune city witnessed a tough period lasting for a few decades. The city’s economy was in shambles. Many scholars and learned experts left the city. Things started to improve towards the later half of the 19th century, under visionary leaders such as Justice Ranade (and later on Lokmanya Tilak). Ranade, Tilak and other leaders of that period clearly saw the value of ‘Information’. The citizens had to be educated and informed. The Vasant Vyankhyanmala initiative was born out of the need to disseminate information and create awareness. Justice Ranade delivered the first lecture in 1875 in English. Over the years though, most lectures have been delivered in Marathi. Through its rich 137 year history, there have been very rare occasions, where the series had to be cancelled. For many years, the Vasant Vyankhyanmala was held at Hirabag and Belbag. It has been held at its present venue – Tilak Smarak Mandir, for many decades. Today, this series covers wide ranging topics such as Culture, Arts, Economics, Science, Health, Governance, History, etc. While I have followed this lecture series over the years through media coverage, this was my first year attending it. The event format and the organization was very good. The only negative in my view was the number of attendees (probably less than 500). In the pre-independence era, 1000s attended these lectures. Today, there are many other media sources for getting information, but an informative and thought-provoking live lecture is still a very powerful source. 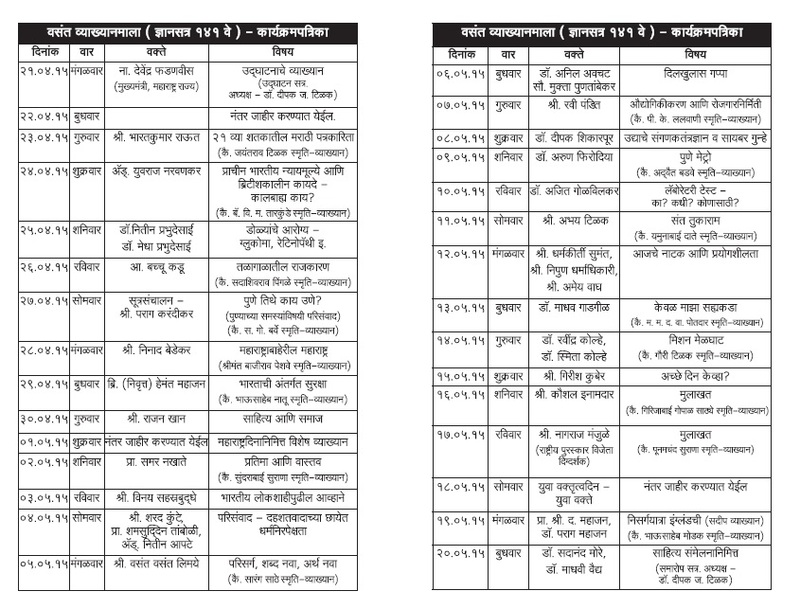 If you are in Pune, you should definitely try and attend at least some of these lectures, over the next 3 weeks. The lectures are virtually free to attend (Single lecture ticket costs Rs 5 and the season ticket is Rs 100). There is a need to get the word out regarding Vasant Vyakhyanmala. More media publicity and social media presence will definitely help. I do hope that in the next few years, this great tradition that started in 1875 will continue to thrive, and reach much bigger audience. Attended an excellent lecture by Shrikar Pardeshi (IAS, 2001. Outgoing head of PMPML) this afternoon. This program was organized PMP Pravasi Manch and Sajag Nagrik Manch. After the lecture, Pardeshi was felicitated by dozens of citizens groups. Pardeshi has achieved a near ‘rock star’ like status among his fans (many citizens of Pune)…A long line of people were queuing up to thank him! This is not something you would see happen very often, especially when it comes to a bureaucrat! Clearly, the work he has delivered in his various roles (PCMC Commissioner, Revenue Dept,….in addition to the short stint with PMPML) has been impressive. For far too long, the PMPML has been in a pathetic condition. It was created in 2007, after the merger of PMT and PCMT. Even before 2007, the PMT was not exactly a great public transport service, compared to services in other cities, such as Mumbai’s BEST. In this context, it is important to understand the good improvements Pardeshi was able to deliver within his short tenure (just 114 days) as the head of PMPML (Pune’s public bus transit service). More importantly, he has initiated some excellent changes that should hopefully have a longer term impact. Pardeshi is moving to Delhi to join the PMO, and I am sure this is great news for him as far as his career is concerned. I am sure he will continue having a great impact in his new position. Pardeshi’s entire talk was full of facts and figures, root cause analyses, and descriptions of various process improvement initiatives. He comes across as a very data driven and details oriented person. He has also demonstrated an excellent consensus building ability across the multiple stakeholders (citizens, NGOs, local/state authorities, etc.) I have tried to capture some of the points from his lecture below. For a long time, PMPML could barely manage to run 60% of its buses on the road. Many of the buses were not in a roadworthy condition due to lack of spares and other technical issues. Pardeshi was able to deliver a quick turnaround here in a short span of 4 months. Presently, this percentage has improved to 75%. This was achieved through better processes, prioritization and funds allocation. A big issue for PMPML has been the financial support from its major shareholders – PMC and PCMC. Pardeshi was able to get the two municipal corporations to release adequate funds for PMPML. According to Pardeshi, one of the big fundamental issues for PMPML is lack of parking spaces at depots. As a result, a majority of the buses are parked on the roads. This makes repair/maintenance difficult. It also results in theft and other problems. PMPML today has just 43 acres of land across its depots. One acre can hold 20 buses. Thus basic maths shows that PMPML is woefully out of capacity for its 2100 buses. PMPML ideally needs a minimum 140 acres. Some progress happening on this front with some of the Octroi Check-Posts land being allocated to PMPML. However, Pardeshi has also urged PMC and PCMC to consider further land allocations to PMPML. In land starved Mumbai, BEST still has adequate space to park their 4500 buses. 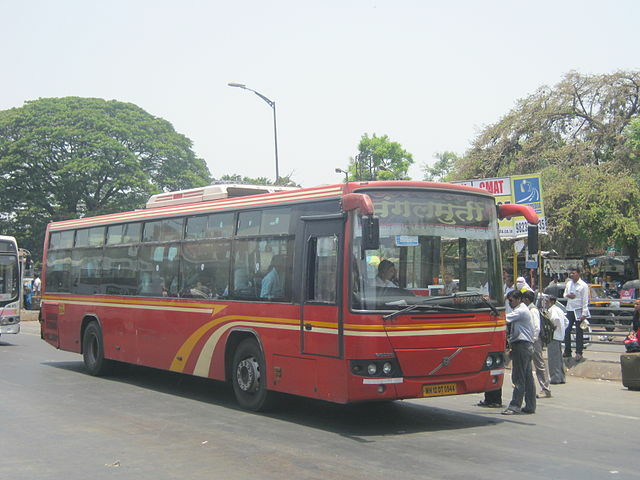 Bangalore’s bus transit authority has over 1000 acres of space for their bus depots! Pardeshi mentioned that BRT has had many issues, but we may see one (or two) corridors starting in 3 months. The main issue of ‘Intelligent Traffic Management System’ (ITMS) is being addressed. This is key requirement for the launch of BRTS. Pardeshi mentioned that the Metro-Rail is essential; but it is worth noting that even by 2030, the Pune Metro is expected to support around 6-8 lakh passengers. PMPML today is already supporting 12 lakh passengers, and this number can easily go up to 24 lakh in 5-6 years. Just 10% of the funds that being allocated for the metro (Rs 12,000 crores) will be sufficient to significantly scale up and improve PMPML. Rs 1,200 crores can be used to add 2000 more buses (Rs 800 crores) and significant structural improvements in the depots and systems. I agree! Metro is necessary..but not sufficient. Today, the population of the Pune region (that is supported by PMPML..) is around 68 Lakh. And this is being supported by just 2100 buses. Bangalore, with a population of 90 Lakh has more than 6000 buses! It was good to hear that today, 60% of PMPML buses run on CNG and the other 40% on Diesel. I hope the CNG percentage improves.. fast! Pardeshi talked a lot about the efforts being undertaken for route rationalization, better scheduling of drivers and buses. He also talked about the urgent need for improving IT systems in PMPML. Pardeshi highlighted how he was able to get help from various NGOs/Citizens Groups to develop a new up to date website (should be launched soon) and mobile apps. Pardeshi highlighted that private sub-contractors are not running their routes as efficiently. He mentioned that the Katraj depot was the most profitable in running their services. Overall, it was interesting to note the cooperation he was able to obtain from various NGOs/Citizens Groups in jointly tackling some of the tough problems regarding PMPML. There were disagreements on some issues (e.g. pricing of tickets)..but he was able to keep disagreement issues aside and focus on the ones where there was consensus. It was good to note the focus on drivers’ health, and other safety issues. In this short period, Pardeshi was able to launch multiple health checkups, treatment plans, etc.